Noel Conway, a man with terminal motor neurone disease who has spent his final months campaigning for a change in the law on assisted dying, has been awarded a prestigious prize for his efforts. Noel, who was the lead claimant in a judicial review challenging the ban on assisted dying, won the ‘Best Use of Law’ award at the SMK National Campaigner Awards in London yesterday (Wednesday 27 March 2019). In December 2016, Noel, supported by Dignity in Dying, instructed law firm Irwin Mitchell to bring a case against the Secretary of State for Justice to fight for his right to have the option of an assisted death in his final months. 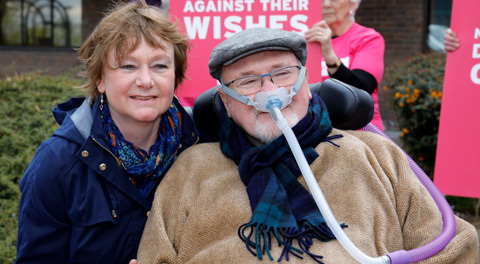 Noel, 69, a former college lecturer from Shropshire, feels, like many terminally ill people, that he is denied choice and control over his death under the current law and that he may be forced to suffer against his wishes. Over almost two years, Noel’s case won huge public support and made a significant contribution to the assisted dying debate in the UK. The High Court and the Court of Appeal both reaffirmed that cases of this nature can be decided upon by the Courts, enabling future cases to have an easier passage. The Courts also confirmed that the ban on assisted dying is an interference with the right to respect for private life, as protected by the Human Rights Act. Although Noel’s case was denied a full hearing at the Supreme Court in November 2018, the judgment acknowledged that assisted dying is an ‘issue of transcendent public importance’ and ‘touches us all’. Noel Conway, 69, from Shropshire, was diagnosed with amyotrophic lateral sclerosis (ALS), a form of motor neurone disease, in November 2014. His condition is incurable and terminal. Noel feels that he is prevented from exercising his right to choice and control over his death under the current law and fears that he may be forced to suffer against his wishes. Supported by Dignity in Dying, Noel brought a judicial review against the Secretary of State for Justice to challenge the law which bans assisted dying, on the grounds that it infringes disproportionately on the human rights of himself and other dying people. After being heard at the High Court and the Court of Appeal, Noel’s case was ultimately rejected by the Supreme Court on 27 November 2018. Polling has found that over half (53%) of Brits would consider travelling abroad for an assisted death if terminally ill and two-thirds (66%) would consider breaking the law to help a loved one do so, yet only a quarter (25%) would be able to afford it. A further 300 terminally ill people end their own life in the UK every year. Dignity in Dying campaigns for greater choice, control and access to services at the end of life. It campaigns within the law to change the law, to allow assisted dying as an option for terminally ill, mentally competent adults with six months or less to live – something supported by 82% of the public.